What Kansas City high school did you attend? I originally joined the Youth Symphony of Kansas City my freshman year of high school (1993) in the then “Middle” Orchestra conducted by Larry Williams. I played in the Middle Orchestra my freshmen and sophomore years of high school when I attended Butler High School in Butler, Missouri about 70 miles south of Kansas City. My junior and senior years of high school, I played in the Senior Orchestra under Glenn Block and attended Paseo Academy of Fine and Performing Arts in Kansas City, Mo. when that school was in its heyday as a magnet school for the arts. Why did you audition for YSKC? A family friend from Kansas City was on the (Youth Symphony) Board and knew I played horn, and suggested I audition. I grew up in a small town, so rehearsing and performing with the Youth Symphony was a wonderful opportunity for me to meet other young musicians and to perform at a very high level in a large orchestra, which my local high school did not have. What is one of your favorite Youth Symphony memories? One of my favorite highlights was our 1996 tour to Banff, Alberta. We rehearsed and performed Tchaikovsky Symphony No. 5, Sibelius’ 1st Symphony, and Strauss’ Der Rosenkavalier Suite as part of a youth orchestra festival. It was amazing to tour with all my friends from Youth Symphony and to hear and get to meet other youth orchestra musicians from around the world in Canada. Another favorite memory was performing for the horse show at the American Royal each year. We got to play amazing music at a very high level with phenomenal performers from Kansas and Missouri. What did you learn from playing in the Youth Symphony? I learned how to be team player, the value of hard work and practice, and the joy of making music together with friends. So many of the skills I use in my daily life can be traced to four years of 3-hour Sunday rehearsals, and the time during the week spent listening to recordings and practicing the music. What did you do in the five years after high school graduation? I attended the University of Michigan Ann Arbor majoring in French Horn performance, and blended that into a custom degree adding performing arts technology, interactive art, and engineering. 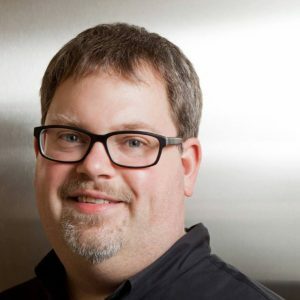 In the summers of my junior and senior year of college, I worked for a music technology startup in Quebec, interned at Yamaha Corporation of America in Grand Rapids, Michigan, and began the first year of my masters degree study in music education at Oakland University in suburban Detroit, Michigan. How did you end up at NYU? I completed my masters and PhD in music education at Oakland University, taught three years of middle school general music, and then got my first job as a music education professor at Indiana State University. After two years there, I spent five years on faculty at the University of Massachusetts Lowell. 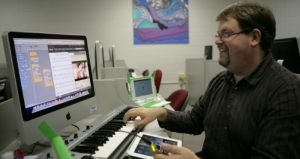 In 2013, I was invited to apply for a new position at NYU and joined the faculty in September 2013 as an Associate Professor of Music Education and Music Technology, and founded my research lab, the Music Experience Design Lab – https://musedlab.org/ – where we research and design new technologies for music making and learning. Can you explain your role as Director of Music Education at New York University and as an Associate Professor of Music Education and Music Technology? At NYU’s Steinhardt school, I coordinate the Bachelors, Masters, and Doctoral degrees in music education where we have approximately 100 students, and I collaborate with my faculty colleagues in the music technology, music business and educational technology programs. We believe strongly in giving our music majors an global music education, so we just instituted a built-in study abroad semester at our NYU Prague campus. I also teach a summer course in Creative Learning Design at our NYU campus in Shanghai as part of their Program on Creativity and Innovation. A large part of my time is also spent in my research lab developing new tools for creative music making with partners like the New York Philharmonic, Herbie Hancock, PBS, and Peter Gabriel. We’re even starting to explore some new collaborations with the Kansas City Symphony. You can learn more about our work at https://musedlab.org/. What do you think of when you think of Kansas City and the arts scene? I think it’s absolutely amazing. My family still lives in greater Kansas City, so I get back to town a few times a year. I love the new performing arts center in downtown, and am happy to see music and the arts thriving even more than when I was in high school in Kansas City. What would you want to say to current Youth Symphony musicians? I’d like you to know that you are so fortunate to be a part of the Youth Symphony organization. The life and musical lessons you are learning will benefit you for the rest of your life. If you go on to choose to pursue a career in music, you are so well prepared for success in music school by way of the rigorous schedule and training you are receiving. And, if you choose not to pursue a career in music, the lessons of hard work, dedication, and practice will serve you well throughout your life. Now that its been over 20 years since I last performed with the Youth Symphony, I still count many of my fellow musicians as close, life-long friends. Enjoy your time in YSKC!